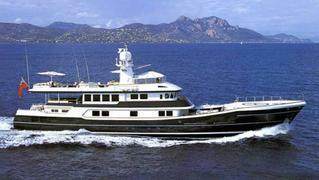 Rory Trahair tells me that I can broadcast the news that Edmiston & Company and Merle Wood & Associates will be providing cocktails and canapes aboard their joint listing, the 49.95m motor yacht _Shandor _this Friday, April 9th from 5pm to 7pm at the Antibes Yacht Show. This superyacht, the first true expedition yacht, offers the opportunity to explore the world in comfort and safety. She is one of the most seaworthy yachts of her size, is full of character and offers unparalleled deck and dining space – along with comfort and safety at sea and is asking €8.975 million. If you plan to attend, please email an RSVP to one of the addresses below.